A new review every Thursday! Join me as I work my way through every episode of ALF, in order, because you asked me to do this, thereby proving that man gravitates naturally toward evil. Seriously, this show is awful. ENJOY! Episode 8: Don’t it Make Your Brown Eyes Blue? Episode 10: Isn’t it Romantic? Episode 14: Can I Get a Witness? Part 1: Hey, a Movie! Misc. 10: Check out this ALF syndication trifold! Howdy, I got over to your webpage via Facebook. Not something I usually read through, although I like your thoughts none the less. Thanks for developing some thing worthy of reading! Do you have any plans to eventually review Project Alf? The movie doesn’t really wrap things up but at least it continues where the show left off, sorta. Yes, I will! At least, as long as I can get a copy. I’ll review that last…most likely. I’ve been absolutely loving these Alf reviews. Keep ’em coming! I never watched the show as a kid, but as an adult I got curious to see if it was as bad as I heard it was. After I saw a couple episodes, I was hooked because it’s a complete train-wreck of a sitcom. I’ve seen most of the episodes on TV over the last year or so, and I just can’t believe just how BAD the writing was. How did it last for 4 season? I think if it didn’t have the Alf puppet, it surely would have been canceled after the first season. One strange detail I noticed that you should keep an eye out for…in all the scenes where the Tanners leave the house and are in the car driving around, it’s ALWAYS at night. I’ve never once seen them drive around during the day. Now you could say that they didn’t drive around during the day with Alf because it was too risky, but there have been episodes where Alf wasn’t even in the car. There were also times where they HAD to get in the car due to something Alf did, and it always just happened to be dark outside even if it seemed like it was in the middle of the day. Maybe filming the car scenes at night was easier for the production team? Cheaper? Not sure, but it’s weird nonetheless. Thanks for the kind words! Stick around for the rest of the journey. I’ll need all the help I can get. Good point, I didn’t think about the “On the Road Again” episode with them driving the RV during the day. What I was originally thinking was their car specifically, so I didn’t even think about the RV. I definitely can’t remember a single time ever seeing them driving the car around during the day though, so just keep an eye out. I haven’t seen all the episodes, so I may be wrong, but I saw enough scenes of them only driving the car at night to think it was strange. I also found this link which might be helpful for you for upcoming reviews. It’s a list of the specific cuts in the syndicated and DVD versions of the Alf episodes you’re reviewing. It’s far from complete, but there is a good deal of information there on many episodes. It might help fill in some plot-holes or inconsistencies due to edits as you’re watching future episodes. I thought I responded to this but I guess I didn’t: thank you for that link! I wish it were more comprehensive, but that is indeed interesting and helpful! That would have been interesting if ALF was, say, a costumed actor and not a puppet – yeah, the show would never have been picked up in the first place, as quality aside, it would have been too similar to other “alien” sitcoms! Really enjoying these reviews! LOLed several times and I’ve only read the first seven so far because those are the only episodes I’ve watched but I’m hoping to catch up. I must be some kind of masochist ’cause I’m watching the region 2 DVDs which for the most part have the episodes as originally broadcast rather than the shorter, syndicated versions. I should have the German DVDs soon, thanks to some kind readers. As far as I could tell, that was the only release that got them uncut, but maybe I’m wrong! Or maybe there are several kinds of edits floating around. Either way, I hope you really love episode 8! 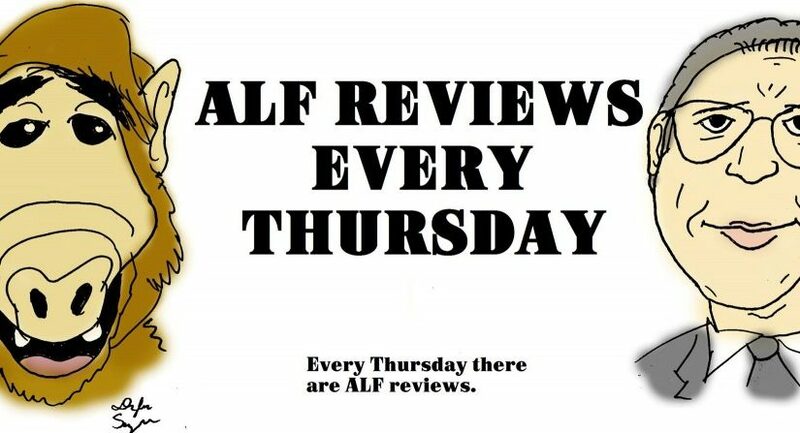 Are you going to review any ALF-related products, such as the audio cassette adventure, the comics, and the records? I asked this about the spin-off shows and you didn’t even bother to answer the question. ALF had spinoffs? Eight Ochmoneks is Enough? Alien Task Force: Special Victims Unit? Google image search is currently letting me down, so for now I will just try to describe this crazy Alf thing I once owned. In 1996 my then-girlfriend went to Germany for her senior trip, and brought me back a large Alf statue that was wearing lederhosen and had a knapsack on a stick slung over his shoulder. She knew that even at 16, in 1996, I was a crazy big Alf fan, and apparently at that time he was still big over in Europe. Enough so to easily find a large statue of him, at any rate. I have absolutely no idea what has become of it, if it’s sitting in some box at my grandmother’s or whatever, but man I have to find a pic of that ridiculous statue that I was so happy to receive. Hey dude, I love the ALF reviews. Totally awesome, man. Thanks for the kind words! Stick around. Hey Philip, what did you think of Max Wrights performance on the Norm Show? I loved that show! It’s a shame it didn’t last longer. I’ve been meaning to pick up the DVD but haven’t gotten around to it. I read some of your reviews. Why are you attacking this show left and right? I watched this as a kid and i still do. I’m a fresh Chemistry graduate and the light, funny comedy plots of ALF has helped me deal with a lot of stress during exams and my dissertation writing. I cannot believe that there are so many people agreeing with you! Have you tried making a show?? You must give them credit for the simple comedy they’ve created, without try to critically evaluate every word they utter? I feel sorry for you’ll coz you can’t just sit back and relax and enjoy a show. I cannot believe you’d have the gall to say you enjoy ALF. Have you tried making a show?? A Max Wright sighting in June 2015! If the dude is living in Hermosa Beach, he’s not doing too bad for himself, tabloid allegations notwithstanding! Will you review other shows besides ALF, like the ALF cartoons? Thank you. An Oral History of ALF. Jean & Reiss talk about the “I’m Your Puppet” episode. Benji Gregory is there. Some interesting stories. So, I was watching an old Mork and Mindy (“Alas poor Mork, we knew him well”) researching into the nature of executive meddling, and something struck me as odd. Mork is a paranoid hypochondriac in the show, and at one point he throws a plate he believes is lead painted out of a restaurant doorway into the hands of the shows resident escaped mental patient Exidor. He proclaims it to be an object from the Melmac galaxy – and that would be a full 5 years before ALF is piloted. So was Melmac an existing alien thing, or did Paul rip his planet name from a throwaway line from a dying sitcom? I think they got it from the brand of melamine, but certainly it’s the first time that I heard it used in a space context. Yeah, the planet Melmac is definitely a reference to the dinnerware company Melmac. Mork and Mindy did make that joke first, but obviously in a very different context. It’s hard to say whether or not Fusco lifted it. We’ve seen him lift OTHER material for sure, so it’s fully possible…but it’s also possible it was subconscious plagiarism, and he didn’t realize that he’d heard the joke elsewhere before he made it. Honestly, you deserve a Pulitzer for your Alf coverage. Is it bad that this website, and your reviews, were my first thought? Is it worse I’m kind of rooting for it so that we can get more reviews? Alright, who’s going to put me in touch? You should follow the Facebook page for quick updates! I’ll paste what I said there, but there’s no cause for concern. If ALF reanimates, so will the reviews. But, y’know. He won’t. So there’s that. 1) Yes, ALF is potentially getting a reboot. 2) Yes, I would review it. 3) Yes, I would write for it, but I have no connections so by all means put me in touch with whomever would like to speak with me. 5) No, it isn’t going to happen, because there’s about a 3% chance AT BEST that Paul Fusco won’t actively alienate (hoho) everyone in support of the project. Very few of these reboots we’ve been threatened with the past few years actually make it all the way to existing. Way too soon to worry.